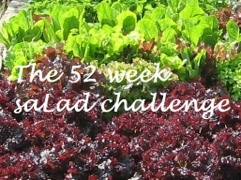 The vernal equinox has arrived and the garden is waking again from its wintry slumbers so it seems a good time to review my progress so far in the 52 Week Salad Challenge. You will find my previous posts on the subject here, here and here if you would like to read them. The aim is to put home-grown salad on the plate every week of the year and technically I have managed to do that, but I don’t feel very satisfied with what I’ve done. What we have eaten has been either repetitive or in very small quantities or often both. In the garden there were only a few mizuna and mustard plants clinging on to life, offering little plus the over-wintering peas that I robbed a few shoots from. No more thanY a few mouthfuls. 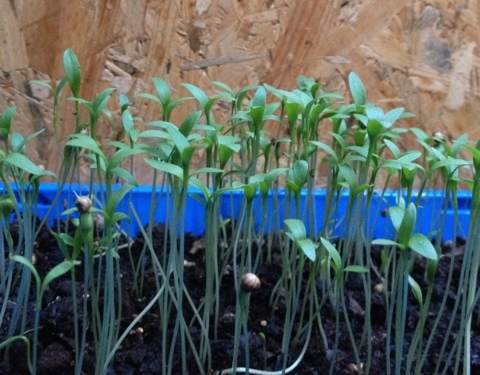 I tried growing micro greens indoors – the harvest was tasty but minuscule, I didn’t get to grips with successional planting and I quickly got tired of having trays of seedlings cluttering up my kitchen work top (the only place with sufficient light). 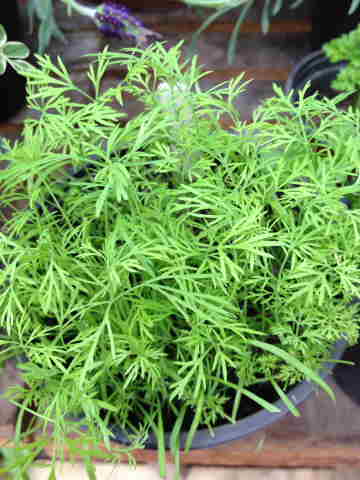 But I potted up several of the seedlings of parsley and coriander and they are growing on now in the greenhouse. I’m told I did well to get parsley to germinate that early in the year, for which I should probably thank the potting shed’s over-enthusiastic wood-burning stove and excellent insulation! The challenge pushed me to resurrect my sprouting jars. I tried a few seeds that were new to me but quickly settled into my old favourites – chick peas, mung beans and alfalfa, plus a new one, Puy lentils, which are delicious. So, overall not a resounding success, it is true, but am I down-hearted? No, not at all, quite the contrary. I may not have filled our stomachs but the challenge has made me think, involved me in a community of like-minded gardeners and fuelled my determination to do better next winter. Ever since I started this garden I have wanted to grow food for all year round but have never come close to achieving it. I gave up growing main crop potatoes because blight gets them, pumpkins are my biggest (only?) success, although the mice ate most of them this year. The trouble is I get all excited about sowing and planting in spring and then I run out of energy and enthusiasm. I think the main reason is that I have never been sure what I should be doing, what crops can be grown for winter and early spring and when to sow, how to make a follow-on crop fit into a four year rotation cycle. A few weeks ago Michelle, whose idea the salad challenge was, interviewed Charles Dowding, the well-known organic gardener and advocate of no-dig gardening, for her blog. As a result of reading this very interesting interview I bought two of Charles’ books*. 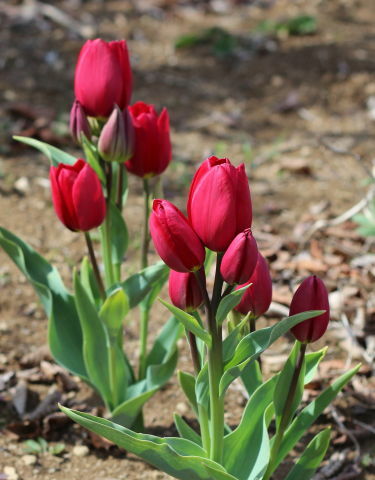 The books are just what a gardener needs – they inspire you to try something and they give you the information you need in order to succeed, plus there are lots of good photographs. He has also written a book on salads for winter, but I went for the winter vegetables one because, in truth, I don’t want to eat a lot of salad over winter, I prefer warm vegetables and veggie-packed soups. In any case there are sections on salad growing in the book. I was surprised to learn that many of the winter crops have to be started now, I had assumed one started them much later. I can’t wait to get going when the current cold spell lets up. 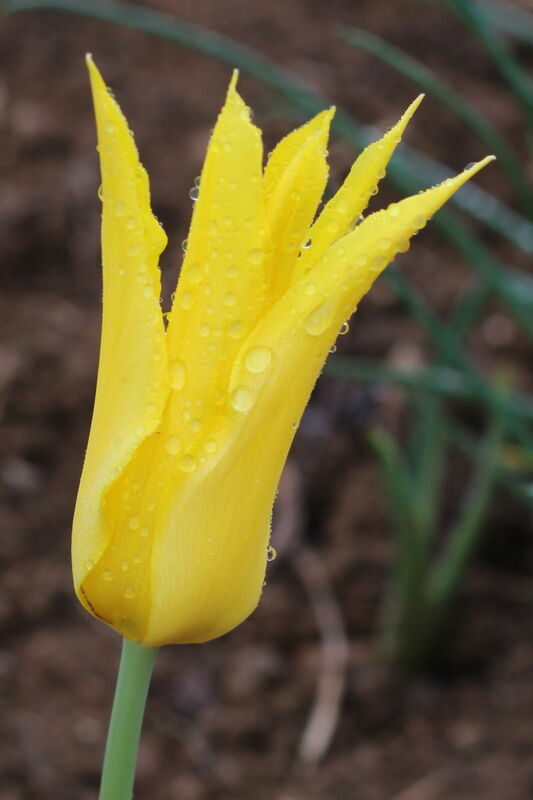 My plan is to grow as many different things as I can since there will inevitably be failures (our mountain winters are very unpredictable) and I will start to learn what works and what doesn’t. You never know, I might even manage to grow Brussels sprouts (which are very nice raw in salads, by the way). And, of course, I will tell you all about it. One final thought on salads: if, like me, your vinaigrettes can be a bit hit and miss you will find a great vinaigrette recipe here on Carl Legge’s excellent website. In fact, you’ll find lots of lovely recipes there, including salads made with foraged plants and even ‘weeds’. 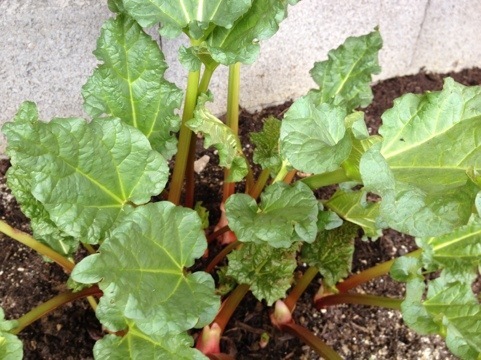 not a salad but you may remember the rhubarb that I dug up and then forgot and finally transplanted to the greenhouse after weeks of bad weather. Well, here it is looking very happy and we had our first taste of the year this evening, stewed with apple, orange zest and cinnamon. 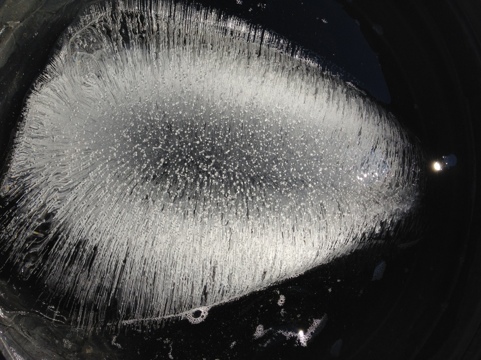 What do you do when you missed ‘Wordless Wednesday’ and you have some pictures you want to share? You do a ‘Photo Friday’, which has the added benefit of allowing words. 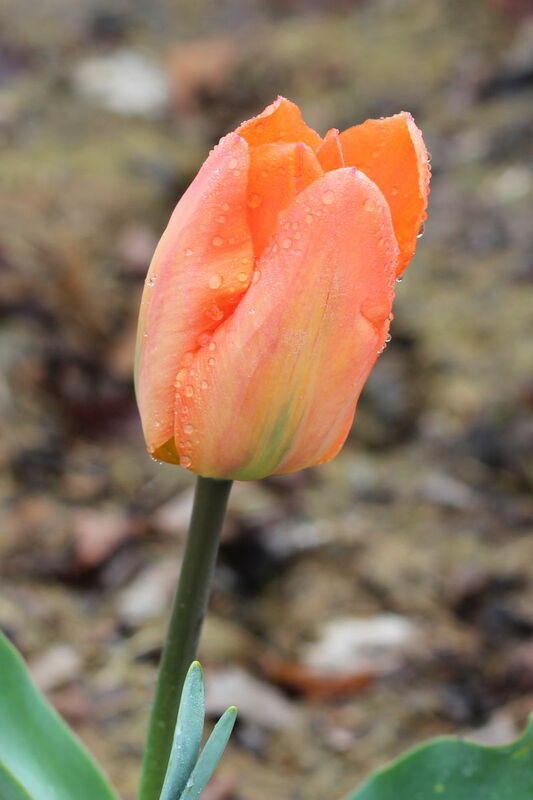 The bad weather has damaged both the petals and the leaf tips, unfortunately, so perhaps ‘gorgeous’ might be overstating it a bit, but it is there, brightening up the sunny rockery, and that’s just fine. 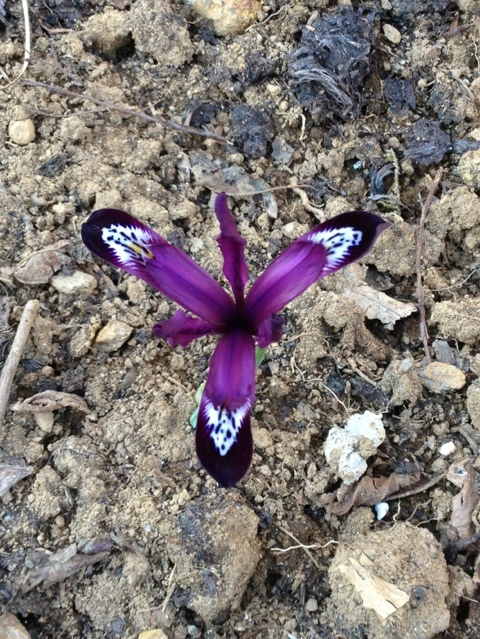 The iris was more of a surprise. It is in a bed just outside the potting shed door, where it doesn’t get much sunshine. 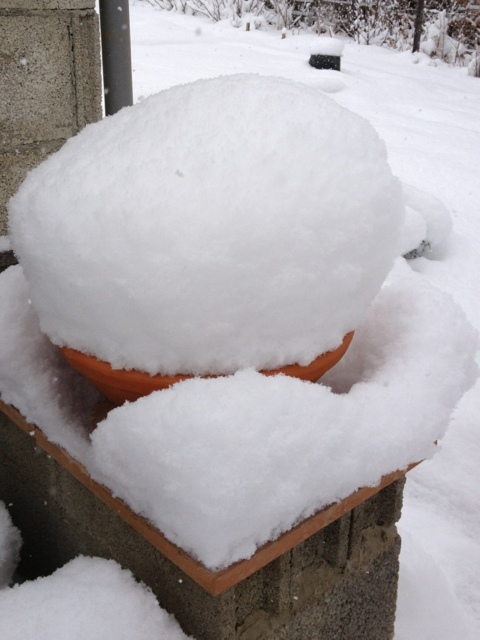 I swear that yesterday it had only just started to push through the soil. Her name is ‘Pauline’ and she is tiny but quite, quite perfect. 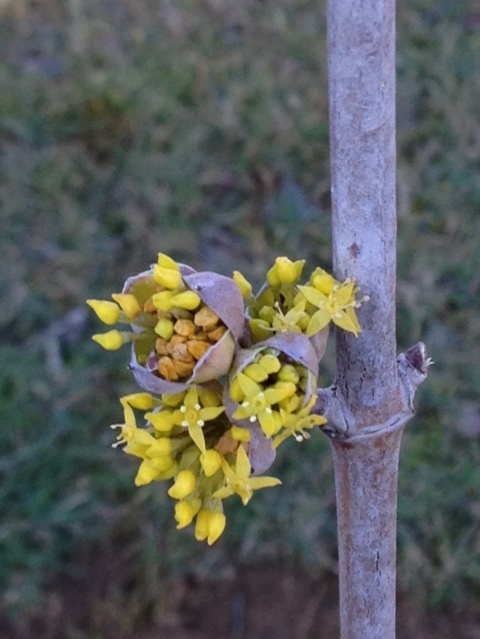 And, finally, not a bulb but the blossom of a tree I had read about and coveted for years but had never seen, a Cornus Mas. I finally planted one last autumn, just a baby, not even a metre tall, but it is covered in little packets of blossom growing along the stem. And what blossom. 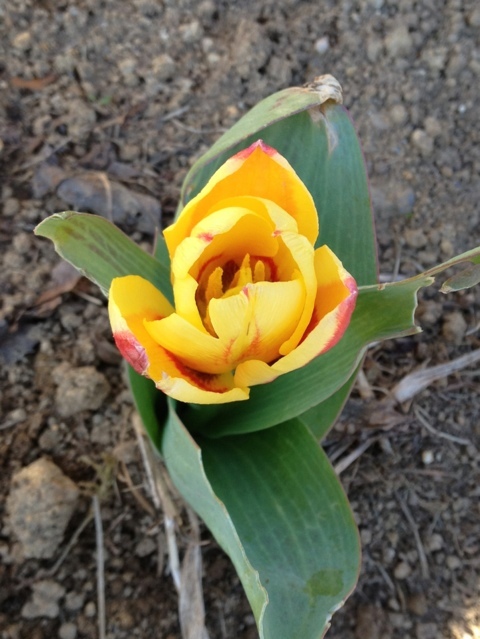 Living and gardening in Ariège is never boring. After five years here I don’t feel that I understand what a ‘normal’ season is. I know that it snows in winter, spring is wet, summer is hot and everyone agrees that autumn is the best season. But beyond that broad brush there is little pattern. Perhaps I need another 20 years here, perhaps global warming is messing things up or maybe mountain weather really is unpredictable. 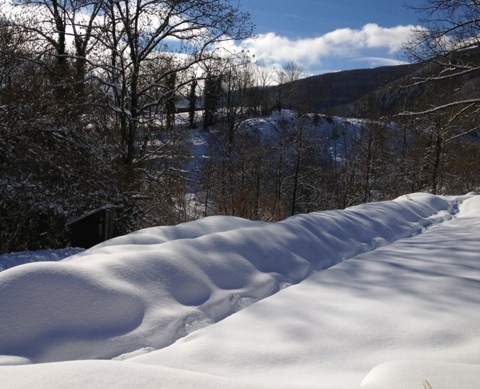 A lot of snow makes a very little water! 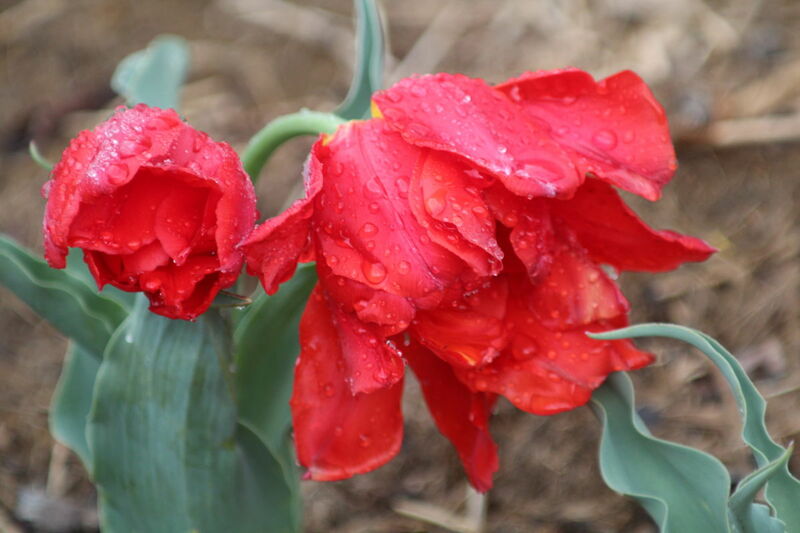 It has been so nice to get out into the garden and the greenhouse this week after nearly four weeks of cabin fever. The snow has done little damage that I can see. 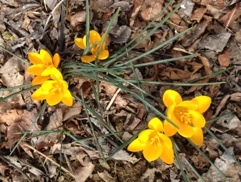 The crocuses are looking so cheerful, the emerging leaves of the daffodils are all a bit bent but they will doubtless sort themselves out. The peas have flopped a bit but the broad beans in the next bed are standing erect and firm. Several evergreens have a few branches with dead leaves on them but again nothing serious. 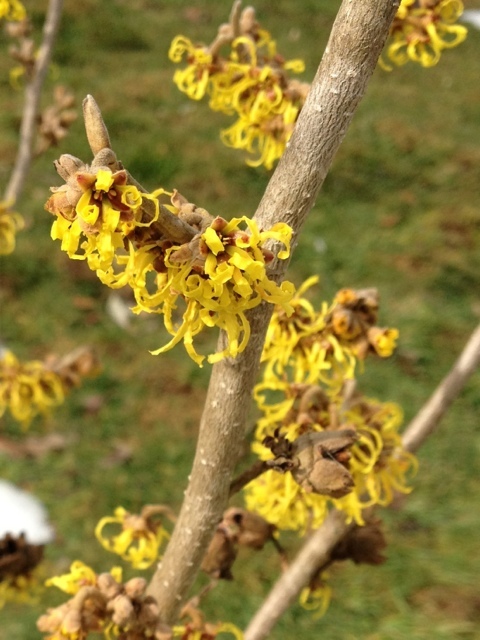 The witch hazel has suddenly burst into flower and smells – well what does it smell of? I’m not sure if I like it or not, but I make regular detours to pass and smell again. This is mole damage. 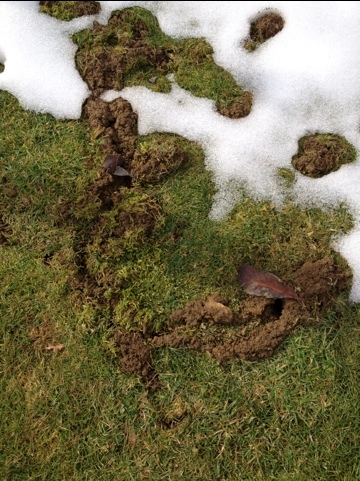 They seem to tunnel at a particular depth and don’t distinguish between soil and snow, so when the ground is covered in snow they gouge our these grooves in the grass. It happens every year but this time it is really bad. I’m just glad I’m not in charge of lawns! 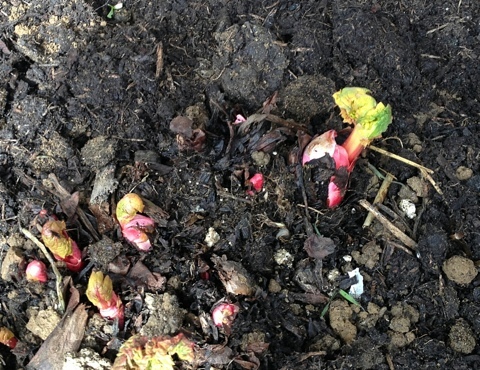 Another post-thaw find was this poor rhubarb lying on the ground. Which just goes to show that even terrible gardeners sometimes get better than they deserve. And the weather forecast? It’s going to snow again tonight. Oh, joy. My original enthusiasm for the 52 Week Salad Challenge seems to have diminished a little, which is a shame. I have been distracted by the problems we have been experiencing with the snow and cold, but I think also I am frustrated at what feels like just tinkering with putting food on a plate rather than getting outside and ‘really’ growing it. I have continued to experiment with sprouting other things than my staple chickpeas, mung beans and alfalfa. The big success has been Puy or green lentils, which taste very similar to mung beans and grow as quickly. They have an advantage over mung in that they do not shed their outer skin. This skin tastes papery and can distract from the overall satisfaction of eating mung sprouts and I often remove as many as I can. To have an easily available alternative without that inconvenience is good news. I have also tried quinoa (pronounced keenwa), which, for anyone who is not familiar with it, is a grain of the amaranthus family. It is popular with people with a gluten intolerance since it contains no gluten. I was warned to rinse them very well because the outer casing is high in saponins, which are a mild gastrointestinal irritant. What I noticed was that the water I rinsed them in was cloudy. The grains were quick to germinate but then reached about one cm in length and stopped growing. Sprouts need either to come from large seeds like chickpeas or to grow a good sized sprout (alfalfa, for example), otherwise they are a pretty disappointing mouthful. Quinoa failed that test and, worse still, was virtually tasteless. I left them several days hoping for more growth that just didn’t come, during which time the cloudiness of the rinsing water worsened, which put me off them completely. I tried growing them twice and threw them away both times. The only other observation I have to make on sprouts is a failure of one batch of chickpeas. I have known chickpeas to start sprouting while I am still soaking them. They are the sprinters of the sprouting world. But during the recent very cold weather one batch barely sprouted at all. Other people on the salad challenge noted the same thing although we disagreed as to whether it was the cold or the low light levels that caused it. I am pretty convinced that in my case it was primarily lack of light, a second batch, started when it was still as cold but the days were sunny, germinated well. I had a bit of a disaster with my first attempt at micro greens (see here) but I tried again. This time I grew peas, coriander and parsley and instead of leaving them under the north-facing roof light each day I brought them into the kitchen in as much light as I could find. In a small kitchen this is, frankly, a nuisance. The results have certainly been better, the pea sprouts grew well and were not at all leggy, the coriander germinated very well, albeit a little leggy. Mark Diacono (@markdoc) of Otter Farm suggests eating the coriander as soon as the seed leaves have formed for the most intense flavour. He is not wrong – the flavour is immense. The pea sprouts have a wonderful ‘mange-tout in a leaf’ taste. Disappointingly, having pick the tops from the peas, rather than regrowing about half of them keeled over and died. The parsley, which I am not treating just as a micro green, I shall grow on some of the better seedlings, germinated very well but were, once again, horrendously leggy. With these I followed the advice of Alys Fowler (@alysfowler) on Twitter and spread more compost on top to cover the long spindly stems. I damaged one or two in the process but the rest really responded well and are now growing slowly but strongly. What excellent advice. One comment I would make about micro greens is that the amount you can harvest from one tray is very small, you still need fully grown salad leaves to make a proper sized plateful. This just makes me all the more determined to over-winter salads successfully this year. 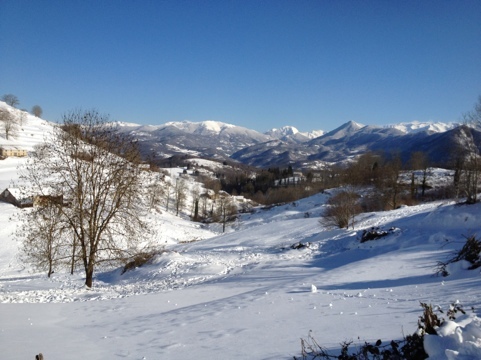 What defines the difference between a British winter and a Pyrenean winter for me is sunshine. Winter here will almost certainly be longer and colder, snow will be more frequent and deeper, but, while Britain can spend weeks under morale-sapping, dank, grey skies, we often enjoy long periods of sunshine. The days are short and the sun is low and weak but the sky is often a deep, vibrant blue that nourishes the spirit. Of course we still have periods like the last ten days, the snow almost non-stop, the sky so low and so grey that it feels like living in a cave. But today the sky is clear once more and it is time to shake off the potting shed blues. So, let’s wrap up warmly against the biting northerly wind and take a walk and some photographs. 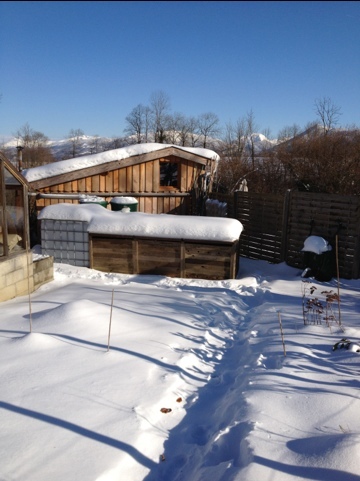 It is still hard going trudging the first 120 metres uphill through the deep snow of the garden, but once on the road it gets easier. 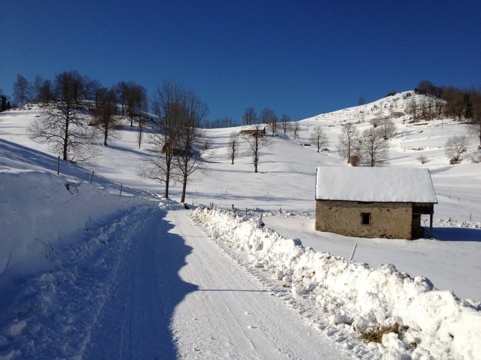 These first two photographs are looking towards the Col de Catchaudégué. I love the shadows in the first picture and the oversailing roof of the hay barn, a typical feature of the barns in our commune. 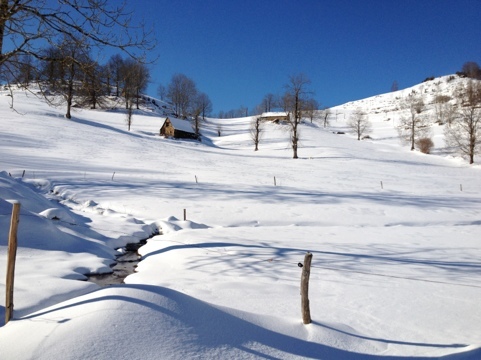 This field is a favourite of mine, particularly under snow. I like to imagine that I am skiing down from the col, past the first barn, arcing gracefully around the second barn, between the two trees, another turn, a little jump over the stream and a well-executed hockey stop before the wire fence. In my dreams! Continuing along the road I hear voices from down the bank and see the local agriculteurs tending their sheep and horses. 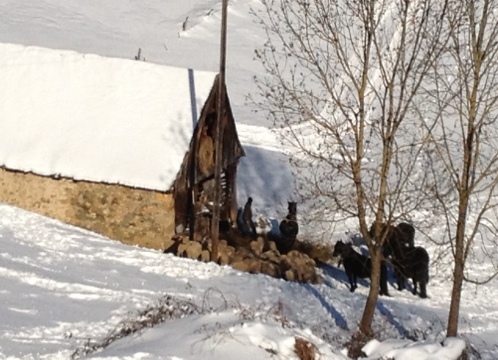 This is the harsh reality of life in the mountains for the locals, trudging across fields in all weathers to bring food to their beasts. 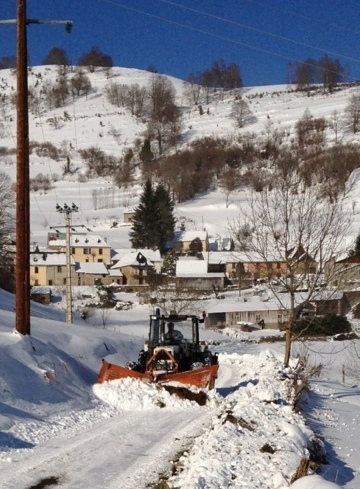 A little further on and another local man is clearing the snow, as he does every day. While the local council snow ploughs clear the main routes our local roads are cleared by a tractor with a snow plough attachment. We are lucky to have this service, we have friends living at a lower altitude than us who still cannot drive their uncleared road. The driver very kindly slows down and moves over as far as he can to avoid covering me in snow, hitting the far bank in the process and having to reverse out. I forget how the ploughs tend to polish the snow and promptly fall over. 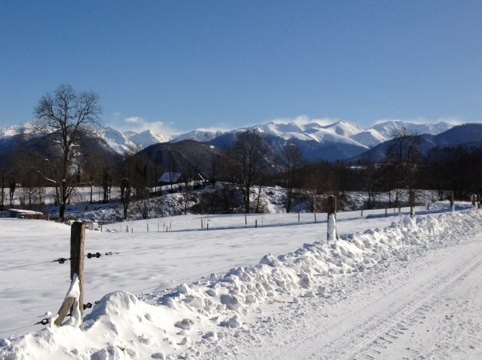 Turning round and heading home I get superb views of la chaîne, the mountain range. The contrast between the soft undulations of the hills and valleys and the angularity of the mountains is so beautiful and a photographer’s dream. Almost home now. The track across the middle of this picture is our drive and the tree seemingly towering above the mountains is a large ash tree at the bottom of the drive. The ‘clouds’ above the mountains on the right is, in fact, snow being blown off the ridges by the wind. One final trudge through the deep stuff and it is back home to a warm fire, a cup of green tea and a slice of carrot cake. I hope you enjoyed the walk. And the tree picture? I seem to be seeing bottoms again. This one reminds me of Yogi Bear. Beating the laurels with a besom. 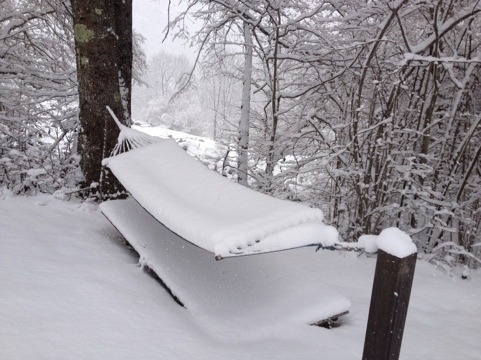 The snow continues to fall and the temperatures do likewise. The road is impassable despite daily scourings by a local farmer with a snow plough attachment on his tractor. His is the only vehicle we have heard in several days. A layer of ice under the snow has turned the road into a skating rink. It is hard to see how that will change until this cold weather lets up, which France Météo predicts will not be for another week. We are cosy in the potting shed, warmed by a wood burning stove and a large stock of wood. We have enough food to see us through, unlike the poor creatures on the bird table who don’t realise that they are tucking into the last of the seed and fat balls. 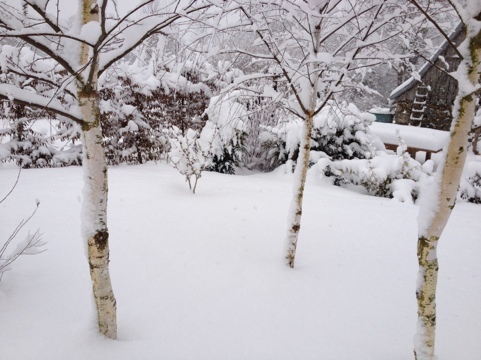 The garden looks delightful under its cloak of snow, covering the bits that never got tidied before winter struck. Several parts of the garden are separated by laurel hedging, some planted nearly five years ago, others only last spring. 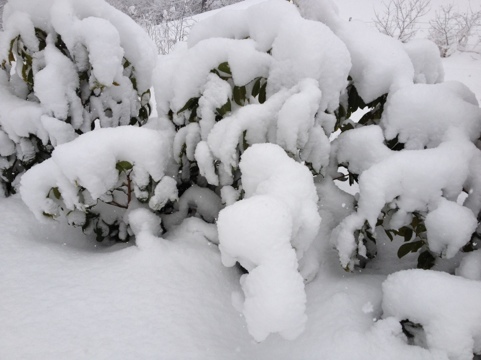 Their large evergreen leaves hold a lot of snow which in dumps like the current one cause the branches to bow down and sometimes to break. One poor plant a couple of years ago lost every branch right down to ground level. 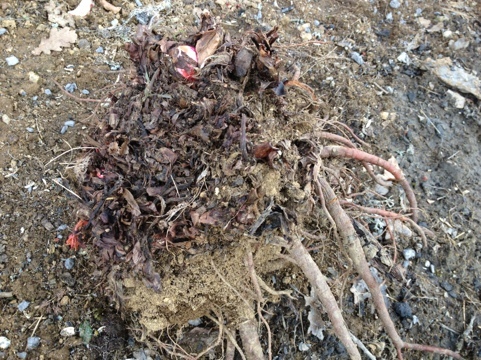 I replaced it and shoved the headless root into the nursery ‘just in case’. It is now a very healthy plant, nearly as tall as its replacement. Laurels are true survivors! But these breakages leave gaps in the hedge which take a while to fill and hedges are all about separating spaces. 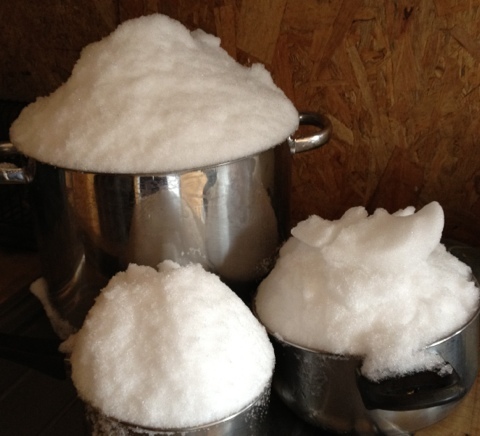 So, to avoid too much damage I knock the snow off before it gets too heavy. Picture the scene: me in as many layers as I can manage, snow boots on feet, ski gloves on hands, beret pulled down over my ears, giving the laurels a jolly good thrashing with the besom. You could, of course, simply shake the branches, but, since snow is a) very cold and b) very wet, I prefer the ‘besom at arms length’ technique. What I have noticed this year is that the mature plants can probably look after themselves now, their branches are thick and strong and an occasional break is not going to compromise the entire plant; it is the younger ones that really need it. I shall be quite sorry when I don’t have to do it any more, I enjoy watching the snow dropping down from branch to branch, having to jump back when I’ve been a bit too enthusiastic. 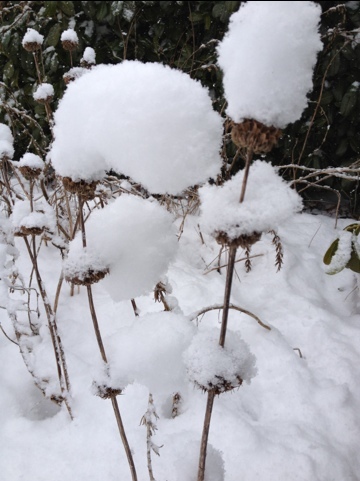 It’s fun, a bit like a solitary snowball fight for gardeners! I had to take a few photographs of course while I was out, snow is so photogenic, then it was back to the potting shed for tea and carrot and walnut cake. I have been trying for days to write a post about reducing the amount of plastic packing I acquire. This may be an important issue (it is to me) and there may be people who would like to read about it (or not) but it is not terribly exciting. It is boring me and I’m writing the thing. 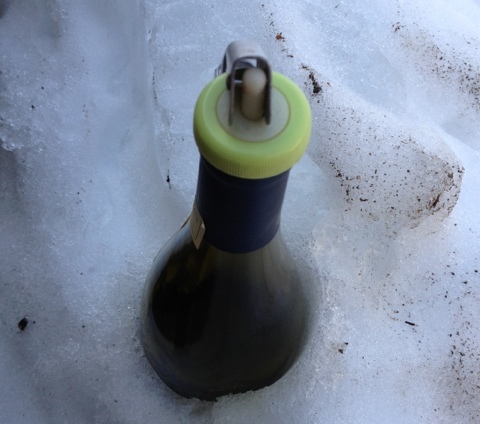 So it is on the back burner for a day or two while I show you some nice pictures of snow and waffle on some more about sprouts and micro greens and … what’s that you say, tell us about the plastic? I have little that is new to add to previous 52 Week Salad Challenge posts. My sprouting is most successful when I stick to mung beans, chick peas and alfalfa; my attempts this week at beetroot, broccoli and aduki beans have been a total failure, presumably due to old seed, although in the case of aduki beans I would say that frankly they are just red mung beans with attitude, which is to say I always have trouble with them, whatever I try to do. So I’ll stick to the Gillian-friendly mungs (which, strangely, are called soja in France). My micro greens growing under the roof light are still underperforming quite spectacularly, apart from the dead ones. I am soaking some peas today which will be sown and added to the micro greens graveyard nursery tomorrow. Winter seems to have arrived at last, due, according to France Météo, to cold winds from Japan, which makes a change from Siberia. It snowed all day yesterday, this morning the sky was clear and the temperature was -10°C, which is ‘flipping chilly’ in anyone’s book except the Siberians. As soon as the sun was up this morning I donned every bit of warm clothing I could find, grabbed my iPhone and took a few photographs of the garden. The one at the top is the kitchen terrace and beyond it the hill called Arp. 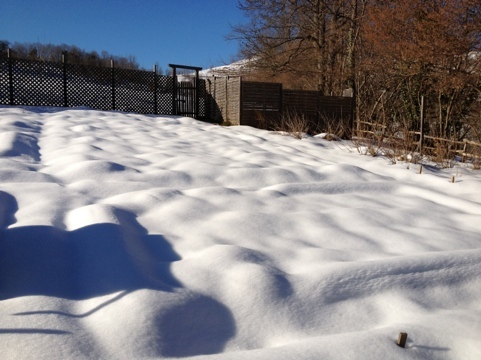 This is part of the area we call the Winter Interest garden and it was living nicely up to its name this morning. Here in the Round Garden is a beautifully whimsical seat designed and built by Alec. 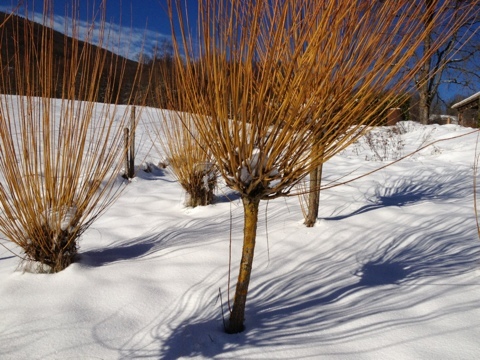 The coppiced willows look superb against the blue sky, the wavy shadows on the snow give extra interest. These two pictures made me smile. 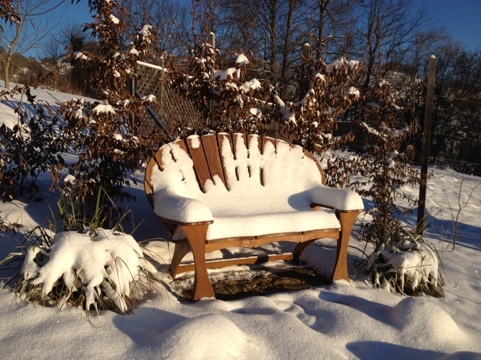 The laurel leaves look like spoonsful of snow and the arm of the bench on the right – well I’ll leave that one to your imagination! 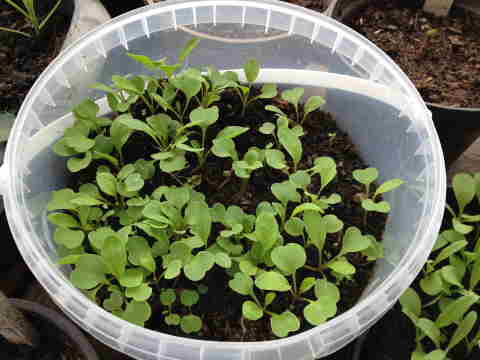 Last week, as part of the 52 Week Salad Challenge I sowed various seeds which I left under a Velux, since the potting shed (where I live, in case you haven’t read early posts) has no window sills and little spare space to store things. I thought the Velux would throw enough light onto the seed trays but clearly it doesn’t because the first seeds to germinate, probably celery, (label things, Gillian, you never remember which is which!) are now tiny seed leaves on very tall and floppy stems. 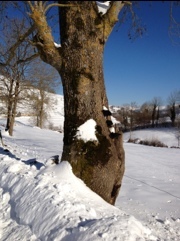 What I forgot to take into account is that the Velux is north facing, with a tall old oak tree only ten metres away. So it’s available light is not good and the poor old seedlings had gone in search of more! 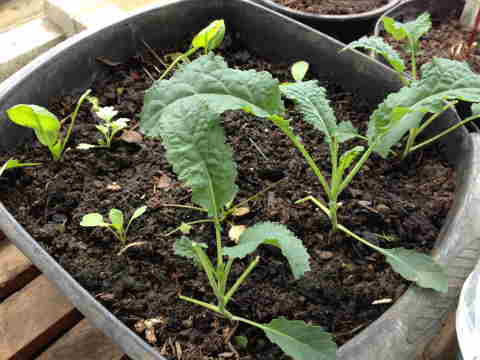 For anyone not used to Twitter’s succinct style that is that I could try repotting the seedlings, burying their leggy stems below the new compost level or, alternatively, just adding more compost to the tray they were in. I would never have thought of doing that. Thank you, Alys. I would like to say I tried it and it worked, but I didn’t. By then they were so leggy and floppy and the seed leaves were so tiny I was pretty certain I would never transplant them in one piece and I couldn’t add more compost because I had sown another variety of seeds in the other half of the container (another habit I really should break) and they hadn’t germinated yet. So, a failure on the celery front, but some great advice for another time. You win some, you lose some. Today, however, saw a success. 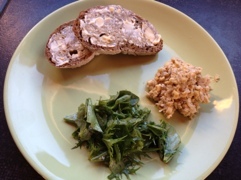 Lunch comprised hummus made with chickpeas that I had sprouted plus a salad of pea and broad bean shoots and a few shallot leaves, all picked from the plants over-wintering outside plus a few surviving mizuna leaves. Most winters these would not be growing in January and the mizuna would be long dead, but we have had nearly three weeks of clear blue skies and temperatures most days get close to double figures for a few hours at least. Alec: What exactly am I eating? Alec: Then why does it have sweet corn in it? I could see what he meant, instead of the usual chickpea mush, the chunky bits did look like rather anaemic sweet corn. I found the texture more interesting than usual and the flavour was certainly more intense. I usually add quite a lot of seasoning to liven it up, this time it didn’t seem to need it. I shall certainly make it this way from now on. Now, what on earth are we going to eat next week?